The skin is the major interface between the human body and its environment. It supports diverse and complex functions from protection to vitamin photosynthesis, thermoregulation, and communication. Although the structure and function of human skin have been well characterized, the evolution of human skin remains inadequately understood. Great strides have been realized in the study of the evolution of skin pigmentation, but the evolution of functional nakedness, humans’ prodigious ability to sweat, and the origins of the human breast (the body’s largest modified sweat gland) are still largely matters of conjecture. The skin’s microbiome is emerging as one of most important factors in maintaining barrier functions, but much remains to be discovered about its diversity and roles in health and disease. How can the many gaps in our knowledge of the evolution of human skin be closed? 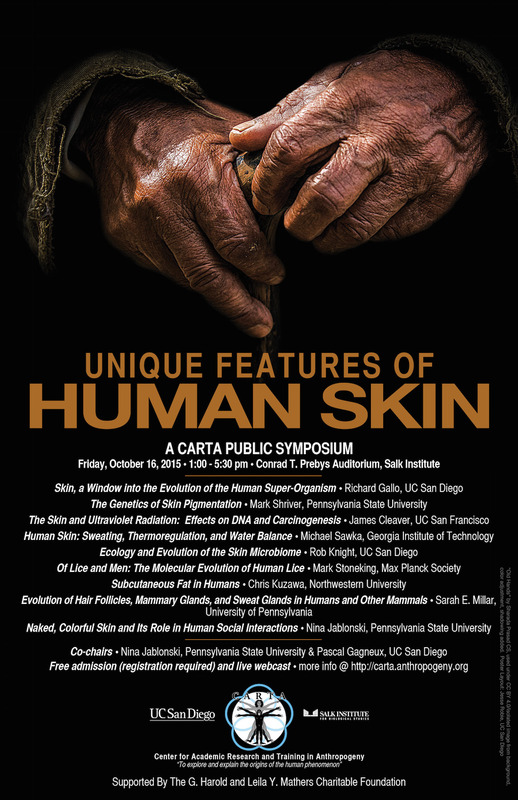 This symposium will bring together scientists representing evolutionary biology, genetics, dermatology, anthropology, and physiology to share their knowledge and questions about human skin in an explicitly evolutionary framework.